BIKERS. Gatty Leceta has invited bikers from Quezon and Laguna; he expects 200 bikers to participate. He will brief everyone during the early morning assembly at Baker Hall. REGISTRATION. Gatty made the waiver and registration forms, printed them, and gave some to Green Planet (bike shop along the highway), which is one of the registration venues along with Bene cafe at Searca dorm in the campus and UPLB Gender Office. 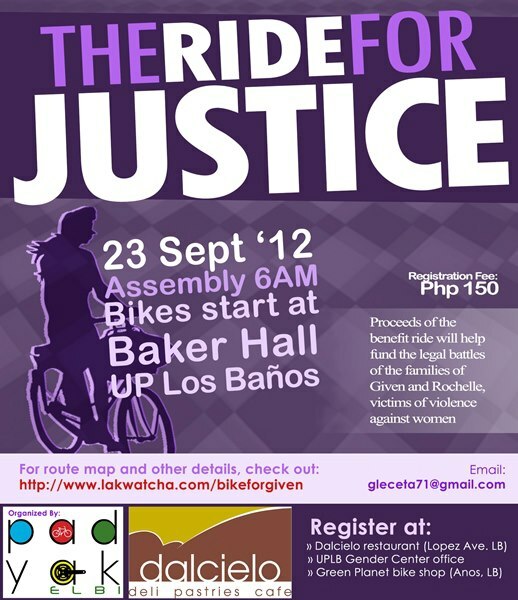 For every P150, P50 will be spent for the bikers' food and P100 will go to the victims of violence. ROUTE. Ari and Gatty went around the campus the other day to trace the route. They made some changes in the upper campus. SO, race starts at the Baker Hall--off to APEC (passing by IRRI and by the site where Given's body was found. The team suggests that bikers stop over for a short prayer or light a candle; Upsilon provided the candles last time there's a gig for Given so maybe we can ask them again?) --back to the campus passing by CEAT--Silangan Road--Kanluran--professional bikers will go up to Jamboree, while the rest may turn left to the Library and back to Baker Hall. WATER. Gatty has invited Aqua Altria and will invite another sponsor for the water stations. MARSHALS. Aside from Kabalikat, the UPLB Pahinungod will be invited (by Kei Tan) to man the 9 stations of the route. PROGRAM. Ms Thennie will invite Ms Noemi (DHK) to host the event and bring the sound system. Assembly is at 6am; bike starts at 7am. Program starts with orientation (c/o Gatty), opening remarks (Ms elen will invite the Chancellor; Given's parents may speak, too), then stretching (c/o Ms Noemi? ).